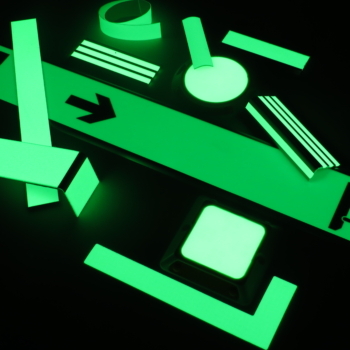 NovaGlow ULTRA Photoluminescent & Retro-Reflective Drive Lane Marking Range are manufactured using non-toxic, non-radioactive luminous pigments that absorb ambient light (natural and artificial) emitting a strong visible glow that is best observed in darkness. NovaGlow ULTRA Photoluminescent & Retro-Reflective Drive Lane Marking Range are a screw or bond down system ideal for lane marking in parking garages, business parks or commercial premises. Consisting of two components, the reflector ensures a clear light mark under illumination by car headlights and absorption of natural light through the day, provides a sustained visibility in darkness with an after-glow luminosity of 1500/230 mcd /m2 when measured according to DIN 67510.